Hola hola. Hope you all had a splendid week! This week we had interviews with the man, the myth, the legend, President Barney! It's always a good experience. Afterward, we had to get our oil changed for the car and it took FOREVER. We were late to our lesson with Chase that night haha, but it was still super powerful! He's continuing to get closer to baptism. But something really cool is, while we were in the waiting room, I noticed an older couple that looked familiar. Turned out they were some members I remembered from the Mankato ward! It was sweet to get to catch up with them. Friday was another odd day. Elder Nielson's eye has been really bugging him the past few weeks so we finally scheduled a time to go to the eye doctor. They checked out his eye balls and they got all dilated and huge, so he had to wear sunglasses all day even though it was super cloudy all day😂. Got a picture to show. But because of all that it made the week a little slow. But some good news - we ended on a high note! The highlight of the week was definitely Derrick's Baptism!! It was amazing and the peaceful spirit there was so strong! It was a bit chaotic because we planned out everything for the program, and literally the day before the baptism, our piano player cancelled and the primary president said she couldn’t show up! So, we scrambled a bit to find people to fill in, but luckily everything worked out ok. Kevin and the Post family also came which was awesome! We ended up having the whole relief society room packed. 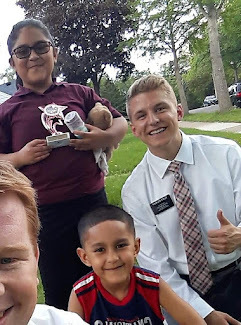 As we were teaching Derrick’s family, we would always teased him about when he gets older he'll have a name tag just like us that says 'Elder Sando'. It was such a cool moment to see him smile from ear to ear and take this important first step closer to Christ and covenant to serve Him😊 Even though he's just 11, he has such strong faith and gospel knowledge. He's an amazing example, and I'm so grateful we got the chance to teach him!